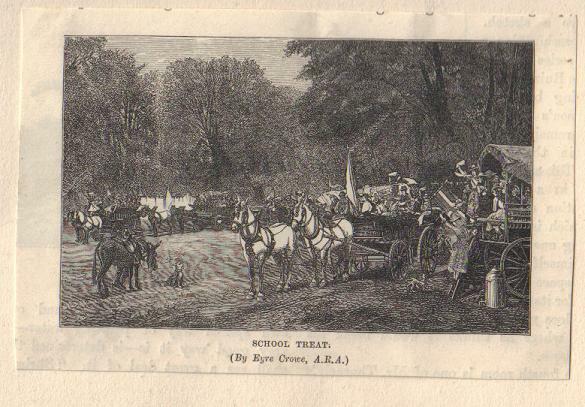 Mr. Eyre Crowe has shown an equal power of getting rid of the picturesque in his ‘School Feast’ [sic] (567), from which all that charms in painting has been as completely expunged as it is from ‘The Return of Captain Cameron’ [by another artist]. The two pictures, considering their size and the position of the painters, are among the curiosities of the year in this respect. Nothing needs so robust a courage and so self-dependent a spirit in the artist as the treatment of contemporary themes … You must go groping among the interests, the relationships, and the feelings of all this crowd to apportion and appreciate them … Mr. Staniland has been greviously weighted with the painters’ usual difficulty to make an English crowd picturesque … how marvellously Cope and Eyre Crowe and J. Clark have missed it we have noticed in another article. The vice of hardness in execution is one to which many more clever modern painters seem to be addicted. It mars the effect of Mr. Eyre Crowe A.R.A.’s otherwise most able ‘School Treat’ (567), a wonderfully bustling and painstaking composition, admirably grouped, full of varied movement and graphic expression; but throughout, in handling, as hard as the nether millstone.